Ten-gallon aquariums are too small for many fish. While a 2-inch-long goldfish may be fine in such a tank for a brief time, he will eventually reach 10 inches or more in length, making him entirely too large for such an aquarium. Nevertheless, several small fish species, including neons, cardinals and small tetras, may live long, healthy lives in 10-gallon tanks. A goldfish swimming in a tank. A young boy looking at an aquarium. 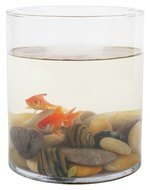 Ten-gallon aquariums are the most common size of tank stocked at many pet stores, but their ubiquity is a reflection of pet retail marketing rather than of the husbandry needs of most fish: More customers are likely to invest in pet fish if they can purchase a low-priced 10-gallon aquarium rather than a larger, more expensive and often more appropriate habitat. Often, 10-gallon tanks are sold in "starter" kits along with a small filter, a jar of fish food and other basic items to help make it easier for customers to simply grab a fish or two and go. An assortment of small fish in a tank. While many fish start life small enough to be comfortable in a relatively small tank, most will eventually require a larger aquarium. 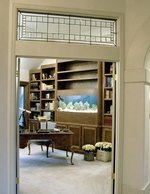 You can use a 10-gallon aquarium while your pet fish are still small, but it's more cost-effective to begin with the tank -- as well as the filters and lights -- that will house the fish for their entire lives. Larger tanks are also easier to maintain, as the volume of water serves to dilute waste. A loach near some pebbles in a tank. Myriad variables, such as the species kept, the tank's design and the filtration system, can alter the algebra; but most aquarists strive to provide 1 gallon of space for every 1 inch of fish length in the habitat. For example, a 4-inch-long loach requires about 4 gallons of tank space, while three 2-inch-long guppies require about 6 gallons of space. The simple guideline is not appropriate for all species, though: Some relatively small fish -- especially active species -- require larger accommodations. A male guppy in an aquarium. Neon (Paracheirodon innesi) and cardinal tetras (Paracheirodon axelrodi) are common captive species that thrive in relatively small aquariums. However, they are not ideal tank mates, as neons prefer lower temperatures than cardinals do. Other tetras, such as glowlight tetras (Hemigrammus erythrozonus), are also well-suited for modest-size aquariums. Tanganyika cichlids (Neolamprologus brevis) -- often called dwarf lamprologuses -- are territorial cichlids from Lake Tanganyika who inhabit small snail shells. However, according to "Tropical Fish Hobbyist" magazine, these small fish are unlikely to fight with fish who inhabit the middle and upper layers of the water. A fish of the genus Corydoras. One important consideration is the social tendencies of the species you intend to keep. For example, danios, tetras and fish of the genus Corydoras are schooling fish who may become suffer from stress if they do not have conspecifics with whom they can travel through the tank. Always maintain such species in small groups, composed of at least six individuals.